It was now winter, and Jesus was in Jerusalem at the time of Hanukkah, the Festival of Dedication. He was in the Temple, walking through the section known as Solomon's Colonnade. The people surrounded him and asked, "How long are you going to keep us in suspense? If you are the Messiah, tell us plainly." Jesus replied, "I have already told you, and you don't believe me. The proof is the work I do in my Father's name." Many people can claim to be something they are not. 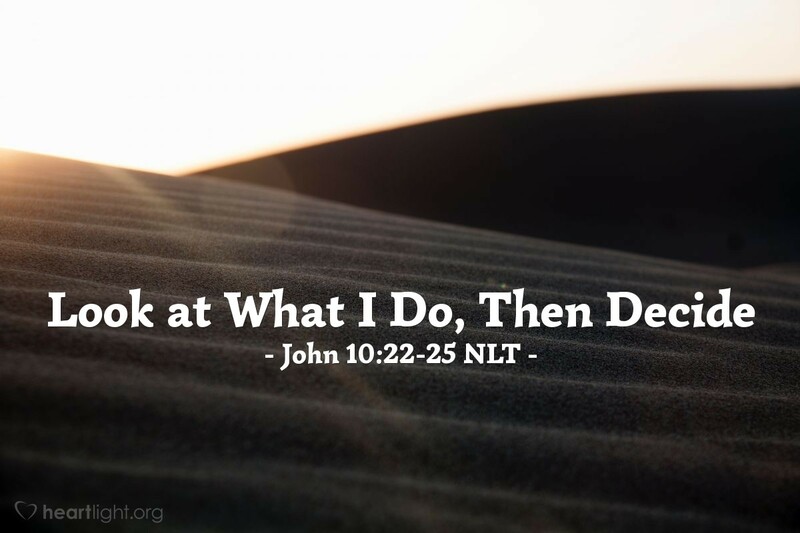 Jesus repeatedly reminded his disciples (including us) that the proof of a disciple's identity is not what he or she claims, but what he or she does. An essential part of Jesus' proof of identity was what he did, too! Want to have a good idea who he is? Then notice what he did and how he lived. Father, please empower me as I seek to live up to what I profess and to practice what I preach. I want my life to be genuine. I want to reflect the values I hold in my heart. In Jesus' name, I pray. Amen.